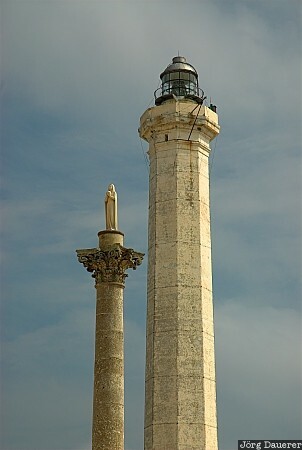 The lighthouse and the statue of the virgin Mary in Marina Di Leuca on the southern tip of the Salento peninsula in the province of Lecce, Apulia (Puglia), Italy. This photo was taken on a cloudy day in April of 2006. This photo was taken with a digital camera.